East to Install - mounts to most surfaces via pre-drilled holes. Holds up to 6 Yale type keys or 4 mortice style keys. Sliding shutter conceals combination lock. Zinc cast body affords protection against attack. Rust free for exterior use & specially coated to resist corrosion. 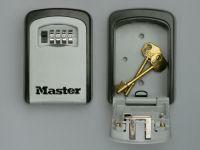 Easy to change combination lock with 10,000 combinations. Used when keys have to be kept securely on site requiring quick access and constructed to deter attack from sawing and hammering, the Master Lock Keysafe is highly weather resistant and inconspicuous.This Keysafe is a good size and can accomodate all types of standard keys (up to about 100mm length) including keys for 5 lever locks - cylinder style locks and even vehicle keys. A wide variety of useful safety/security applications including carrer access and remote location access which does away with the need to issue a large number of keys out. Utilises a user programmable 4 digit security code (10,000 combinations) that may be regularly re-programmed by the user to suit operational requirements.